During idle moments in the final few weeks of 2014 I have been adding some more stressors and features to stress-ng as well as tidying up the code and fixing some small bugs that have crept in during the last development spin. Stress-ng aims to stress a machine with various simple torture tests to trip overheating and kernel race conditions. The mmap stressor now has the '--mmap-file' to use synchronous file backed memory mapping instead of the default anonymous mapping, and the '--mmap-async' option enables asynchronous file mapping if desired. For socket stressing, the '--sock-domain unix' option now allows AF_UNIX (aka AF_LOCAL) sockets to be used. This compliments the existing AF_INET and AF_INET6 IPv4 and IPv6 protocols available with this stress test. The CPU stressor now includes mixed integer and floating point stressors, covering 32 and 64 bit integer mixes with the float, double and long double floating point types. The generated object code contains a nice mix of operations which should exercise various functional units in the CPU. For example, when running on a hyper-threaded CPU one notices a performance hit because these cpu stressor methods heavily contend on the CPU math functional blocks. File based locking has been extended with the new lockf stressor, this stresses multiple locking and unlocking on portions of a small file and the default blocking mode can be turned into a CPU consuming rapid polling retry with the '--lockf-nonblock' option. The dup(2) system call is also now stressed with the new dup stressor. This just repeatedly dup's a file opened on /dev/zero until all the free file slots are full, and then closes these. It is very much like the open stressors. The fcntl(2) F_SETLEASE command is stress tested with the new lease stressor. This has a parent process that rapidly locks and unlocks a file based lease and 1 or more child processes try to open this file and cause lease breaking signal notifications to the parent. For x86 CPUs, the cache stressor includes two new cache specific options. The '--cache-fence' option forces write serialization on each store operation, while the '--cache-flush' option forces flush cache on each store operation. The code has been specifically written to not incur any overhead if these options are not enabled or are not available on non-x86 CPUs. 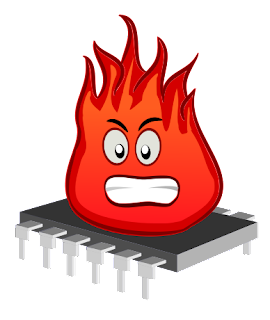 This release also includes the stress-ng project mascot too; a humble CPU being tortured and stressed by a rather angry flame. For more information, visit the stress-ng project page, or check out the stress-ng manual. Earlier this year I was instrumenting wifi power consumption and needed a way to produce and also consume data at a specific rate to pipe over netcat for my measurements. I had some older crufty code around to do this but it needed some polishing up so I eventually got around to turning this into a more usable tool called "sluice". (A sluice gate controls flow of water, the sluice tool controls rate of data though a pipe). The sluice package is currently available in PPA:colin-king/white and is built for Ubuntu Trusty, Utopic and Vivid, but there the git repository and tarballs are available too if one wants to build this from source. Sluice also allows one to adjust the read/write buffer sizes dynamically to try to avoid buffer underflow or overflows while trying to match the specified transfer rate. And finally, sluice as a "tee" mode, where data is copied to stdout and to a specified output file using the -t option. For more details, refer to the sluice project page. It is approaching the Christmas Holiday season, so it's that time again to write some slightly obfuscated C in a seasonal way. This year I thought I would try some coloured ASCII art for the output for a little variety. and press control-C to exit when you have seen enough.